First up thanks to everyone for the kind thoughts and comments. I was really touched. I am doing good but was not warned how boring it is to recover from surgery. The first 4 to 5 days you are so tired and sore and doped up that you do not care. It is the days that follow that are really annoying me. Obviously patience is not my strong suit. I am on day 9 of re-corporation and I am driving myself and my husband crazy. I am well enough that I am alert and functioning but not well enough to be able to bend down or sit at a sewing machine or do anything for more than an hour without dozing off. My life has become a cycle of watching old episodes of Deadliest Catch, making hexies and sleeping. Yipee! 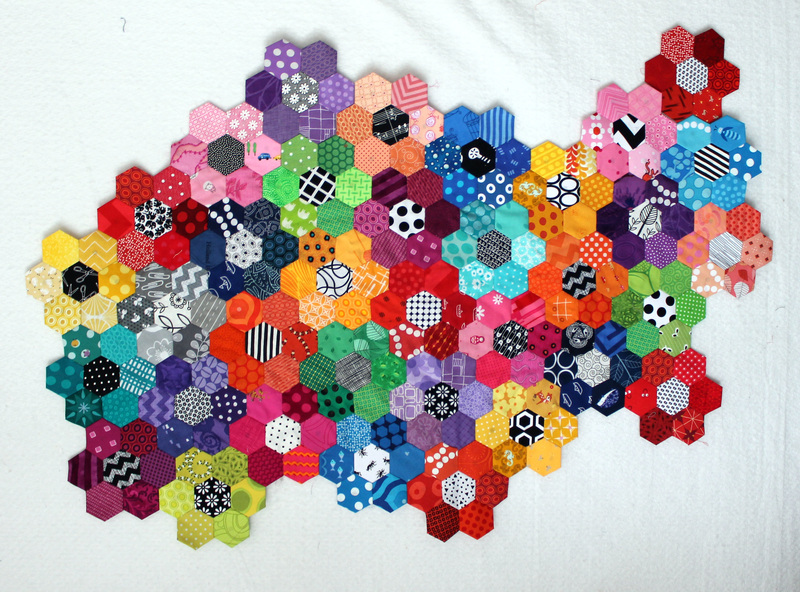 I have been mainly sewing my hexagon flowers together. My placement is rather random – my husband keeps wanting to add a pattern to the placement but I like to just go with the flow. Here is what I have so far…. It may not look like much but I also had to do some running repairs. Some of my earlier stitches were not as small as they needed to be. I had to go back into about 4 flowers and re-stitch. 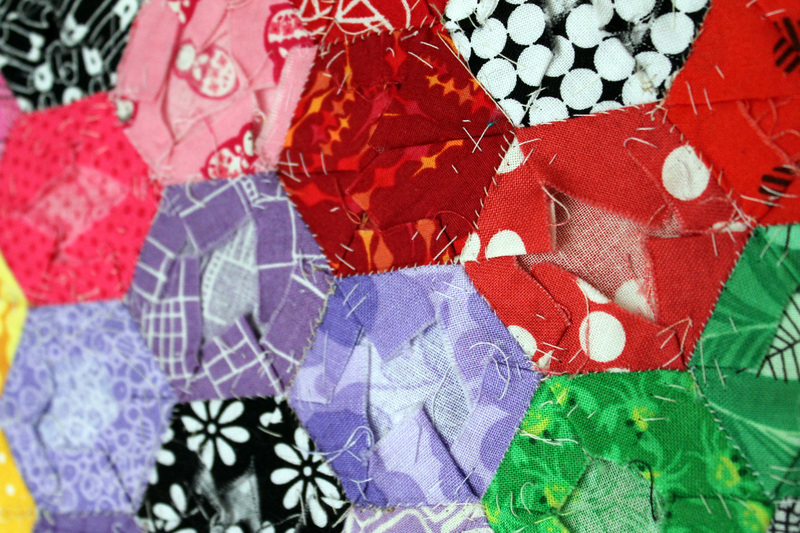 I am a little burnt out on hexagons, but they are really the only quilting I can handle at the moment. My hope is that by Sunday I will be back behind the sewing machine. Come hell or high water there will be a Paper Piecing Monday. Promise. I am late to the well-wishing party! I wish you rest and good TV. Ooh and milkshakes. Milkshakes always help. It’s so good that you have hand sewing to keep you busy. 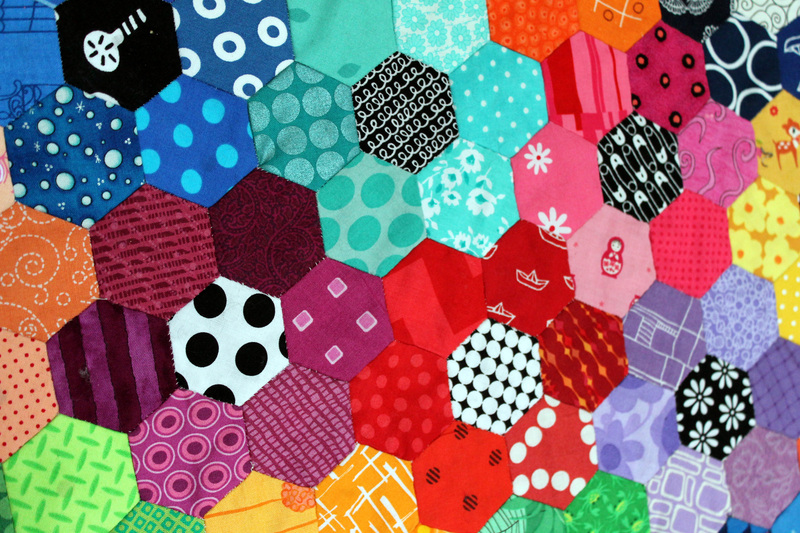 The hexies look great. I had not thought of milkshakes but they sound perfect. I will get the husband on that ASAP. This is divine! I always say, do what you can, with what you have, when you’ve got it! Keep hexing away girl! Love love love seeing you back in my reader and glad to know you are recovering well. I know is be antsy too but those hexies are amazing cath!!! You are making great progress! Sorry you’re still not feeling well. But your flowers are the most beautiful hexi’s I’ve seen and I just love the randomness. Keep pluggin’ away… It’s worth it! Random is good. And the hexis are beautiful! Rest well, it won’t be long before you’re back at the sewing machine, and the washing machine, and the dishwasher… In other words, enjoy this down time while you have it! And your hexies are fantastic! I’m so glad you found those repair needs before the quilt was put together! Sometimes I think I stitch too close together – it almost looks like a satin stitch. But maybe not! Love it! So much colour. Thanks Janet. I gave questioned a couple of times whether it is too much colour but it is too late to change now!